Bad news for American astronomy: The National Science Foundation has declined until 2020 to commit to any funding for either one of the two giant American-built ground-based telescopes. For nearly a decade now, two university consortia in the United States have been in a race to build two ground-based telescopes that would be several times bigger than today’s biggest optical telescope. One group—led by the University of California—plans to build the Thirty Meter Telescope (TMT) in Hawaii. The other team—led by Carnegie Observatories, the University of Arizona, and other institutions—is developing a 28-meter behemoth named the Giant Magellan Telescope (GMT), which would be built in Chile. Over the past few years, both teams have raised tens of millions of dollars toward the billion-dollar-plus projects in the hope that the U.S. National Science Foundation (NSF) would come up with the balance. But now, it turns out, neither project has a chance of receiving any significant funding from NSF for at least another decade. In a solicitation posted by NSF last week, the agency indicated that it does not expect to fund the building of any giant segmented mirror telescopes—that is, TMT or GMT—until the beginning of the 2020s. According to the solicitation, all that NSF can provide right now is $1.25 million over 5 years for the development of a public-private partnership plan that could eventually lead to the building of a large telescope, should NSF be in a position to fund such a telescope sometime in the next decade. I suspect the NSF’s unwillingness to fund this project at this time is directly related to the budget crisis in Washington. Though the NSF got slightly more money in 2012 than in 2011, that money is all accounted for by other projects. There is no margin for anything new that will be as expensive (in the billions) as these giant telescopes will be. Star goes boom, telescopes zoom. Mysterious bubble of light, caused by military suborbital rocket, captured by Hawaii telescopes. Private citizen has just donated $25 million for the construction of the Giant Magellan Telescope. This is how it used to be done all the time: All the early giant telescopes built in the United States before World War II were financed by individuals or private foundations, with no or little government investment. Correction.Regular reader James Fincannon emailed me to say that he thinks the image below is an artist’s impression. He is correct. I should have looked more closely at the press release. In reading the actual research paper [pdf] on the results it seems that the VLT did some very sophisticated spectroscopy, thereby measuring the uneven distribution of the velocity and density of the gas around the star. The image below was then created, based largely on Hubble images combined with the new data. In other words, this ground-based telescope did not match the abilities of a space-based telescope in any way. Had the Hubble images not existed the astronomers would have struggled to interpret their spectroscopic data. Some important astronomy news: The European Southern Observatory’s Very Large Telescope (VLT) has released this spectacular image of supernova 1987a, the first and so far only supernova visible to the naked eye since the invention of the telescope. This image is important for two reasons. First, The data shows that the supernova explosion was not symmetrical, with more material being thrown outward in some directions than in others. This fact confirms what astronomers in recent years have increasingly come to believe: Supernovae explosions are not simple spherical bursts, but chaotic events ripping stars apart in a lopsided manner. Second, this image demonstrates that ground-based telescopes are becoming amazingly good at doing what the Hubble Space Telescope has done routinely for the past two decades. 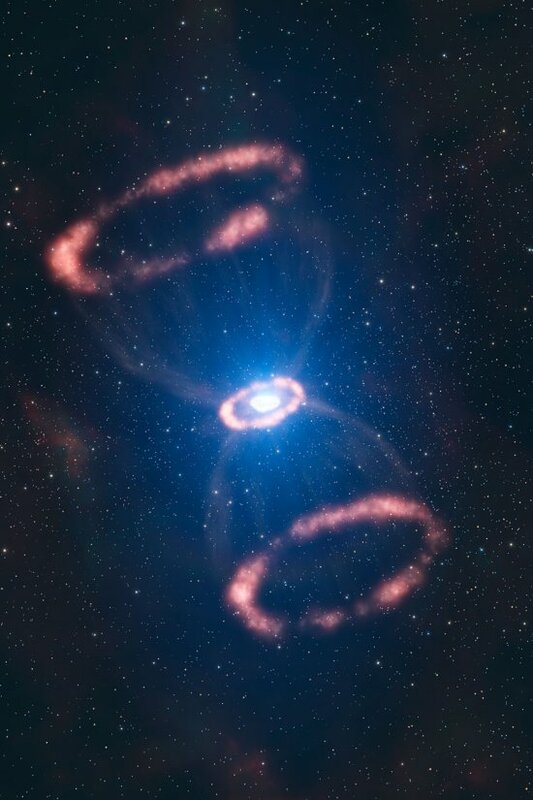 Five years ago, no telescope on the ground could have resolved the inner ring of supernova 1987a. Only Hubble in space had that capability. Now, VLT can do it, almost as well as Hubble. Though a space-based telescope can still beat any ground-based telescope, it is great news that the technology for ground-based telescopes has improved so much, especially since there presently are no plans to replace Hubble. Keith Cowing at NasaWatch notes quickly that the current budget battles over NASA have people in NASA concerned about the future of the James Webb Space Telescope. The telescope has further cost overruns, and should NASA end up operating under a continuing resolution rather than a full budget, there won’t be enough money to keep the project above water. Astronomers have finished the first detailed study, including field trips, for the construction of a telescope on the one of the high mountains near the northern tip of Ellesmere Island, less than 10 degrees from the North Pole.